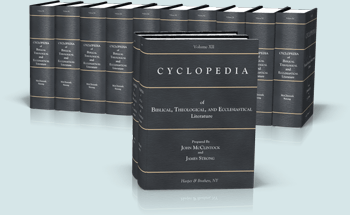 The Cyclopedia of Biblical, Theological, and Ecclesiastical Literature is wider in scope than most Bible dictionaries and topical guides. Rites, Ceremonies, Rituals, Modes of Worship, etc. Regarded as a very useful work in print, as a SwordSearcher book module it becomes much more so. 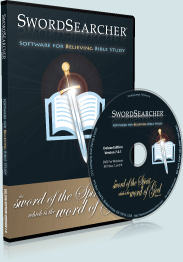 In SwordSearcher, the entire 12-volume encyclopedia is thoroughly indexed by verse reference. With SwordSearcher's unique "deep referencing" and Verse Guide, you can instantly access any article by verse in addition to title. "This Cyclopedia is designed to be a Manual of Sacred Literature for the use of Ministers, Students, General Readers, and Sunday School Libraries so complete in itself that no other work will be necessary for ordinary purposes of reference in these branches of knowledge. It is intended to be scientific and scholarly, yet not repulsive to the mere English reader by an unnecessary display of technical learning. It will be found that the substance of all the valuable Dictionaries of the Bible and of theology in its various branches recently issued is contained in this work." Originally published in 10 volumes with two supplemental volumes by Harper & Brothers, NY, 1880, combined into a single SwordSearcher book module.